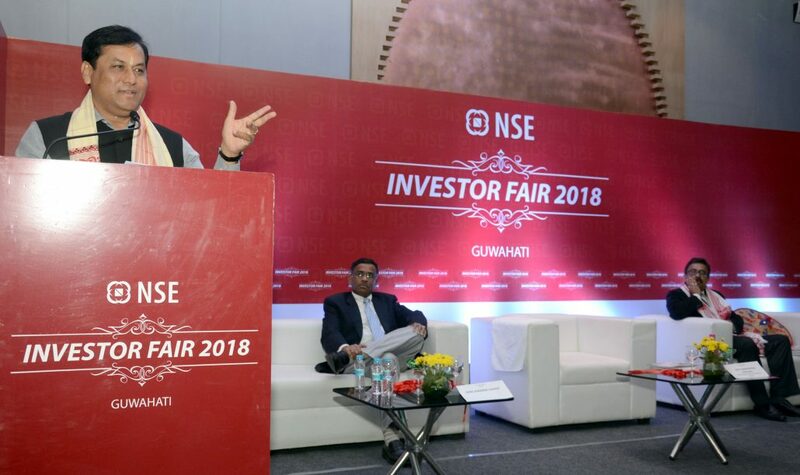 Chief Minister Sarbananda Sonowal inaugurated the NSE Investor Fair 2018 in Guwahati. It is organized by National Stock Exchange. Saying that PM Narendra Modi has put Assam and Northeast at the heart of his Act East Policy initiatives which has resulted in rapid economic development of the region, the chief minister stated that the Global Investors Summit held in February, has boosted the state’s image as a major investment destination at the world stage and lots of investors have expressed interest in setting up their businesses here. The NSE Investor Fair would also provide exposure to the small medium enterprises (SMEs) in the state to gain insight about the capital market and provide them a road map to take confident steps towards growth, he added. Highlighting the state government’s efforts to provide momentum to the economic activities in different sectors, Sonowal said that policies such as The Assam Start Up Policy 2017, Information Technology and Electronic Policy 2017, Handloom Policy 2017-18, Sugar Policy 2018, Biotechnology Policy 2018, Tourism Policy 2017, Solar Policy 2018 etc would help in transforming Assam into a competitive destination for investments. Urging the investors to cash in on the business friendly atmosphere in the state, Sonowal highlighted the major infrastructural transformation initiatives undertaken by the state government in the form of expanding Guwahati into State Capital Region, building an industrial corridor upto Tihu, construction of twin tower World Trade Centre buildings of 65 floors etc which would catapult Assam into one of the top states of the country in the coming years. The recent approval of central government to North-East Industrial Development Scheme (NEIDS) 2017 would also provide a lot of incentives to the business houses for investing in North East, he said. MD and CEO of National Stock Exchange Vikram Limaye also spoke on the occasion and outlined the objectives of the Investor Fair to encourage the SMEs of the region to venture out and get listed in National Stock Exchange for drawing funds from equity market to expand their business. Chairman of Assam Chamber of Commerce Rupam Goswami was also present.